NEW! Custom made red and white toddler socks with CJ logo. One size fits kids shoe size 6 - 11. Stuffed Charger Horse is super soft and ready for cuddling - perfect for your little charger! 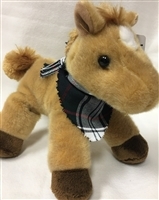 Eight-inch plush horse comes with custom-made CJ plaid neck scarf. NEW! Custom made CJA hair bow from Wee Ones. Made with Wee Ones patented "No Slip Clip". 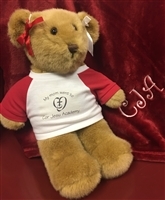 Stuffed Cor Jesu Bear is super soft and perfect for cuddling! Comes with a t-shirt that states "My mom went to Cor Jesu Academy", and two red and white bows. Rabbit Skins 100% cotton soft infant bodysuit. 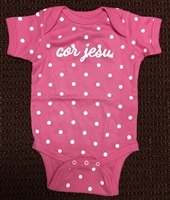 Raspberry pink with white polka dots, and Cor Jesu in white script on front. Available in sizes newborn - 24 months. 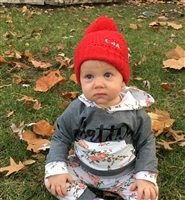 Red pom beanie hat is perfect for keeping a CJ baby warm! 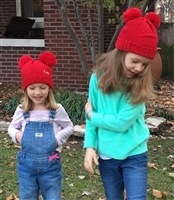 Soft, honeycomb-knit yarn with cuffed rib-knit brim and fluffy pom-pom at crown. Plush, warm micro performance fleece lining. Embroidered with CJA in winter white. Available in two sizes, 0-6 months or 6-12 months. Rabbit Skins 100% cotton soft infant bodysuit. Red with white stripe styling on sleeves, and CJA on front. Available in sizes newborn - 18 months. Rabbit Skins 60/40 cotton-blend soft toddler tee shirt. Red heather with white stripe styling on sleeves, and CJA on front. Available in toddler sizes 2T - 5/6T. CJA Vintage Football super soft tee shirt in 60/40 cotton blend. Red heather with white stripe styling on sleeves, and CJA on front. Available in youth sizes YXS - YL.